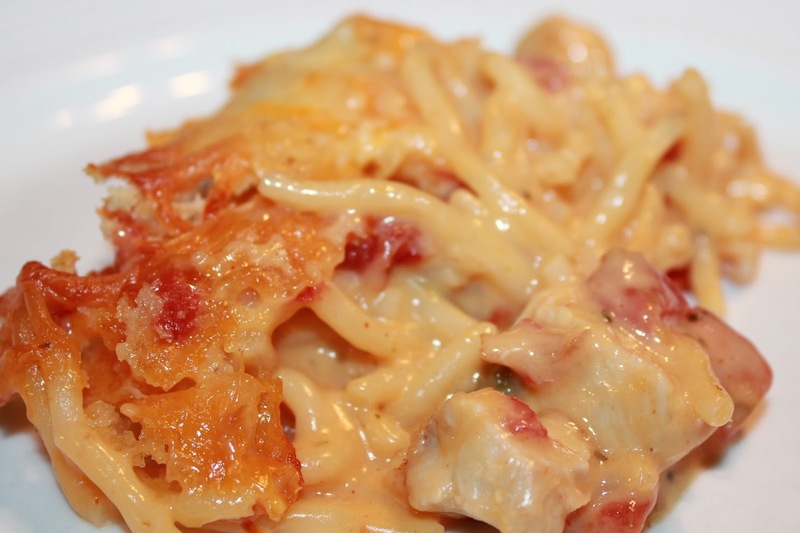 My kids love casseroles and we have been enjoying this one for a few years. This is a very quick and easy casserole to throw together. The recipe calls for canned Rotel which is not available in Canada. Rotel is just diced tomatoes and chilies. When I go to the states I usually try and source some out and stick my pantry. If you do not have Rotel than just substitute with your favourite salsa. My family likes it spicy so I use hot salsa if I don't have Rotel on hand. Heat oil in a frying pan & cook the chicken pieces. Melt the butter in a deep stock pot. Add the Velveeta, Rotel or Salsa, soup, milk, hot sauce & cumin & melt it all together over med-high heat. Add the chicken. Toss it with the pasta. I added about 1 TBS of black pepper here. You add S&P to taste. Grease a casserole dish & put the chicken spaghetti in it. Top with grated cheese & bread crumbs. Cook at 350 for about 30 minutes or until the cheese is bubbling & the bread crumbs brown a bit. Heat the vegetable oil in a frying pan. Cook the chicken. In large saucepan heat the butter. Add Velveeta, Rotel or Salsa, soup, milk, hot sauce and cumin. Melt all the ingredients together. Add the chicken.Season with salt and pepper. Add spaghetti to the chicken mixture. Stir to combine. Sprinkle grated cheese and panko crumbs over top. Cook in 350 degree oven for approximately 30 minutes.